Fixed contractures of the intrinsic muscles may severely impair the function of the hand. A mild contracture may inhibit certain hand functions without any gross deformity. The patient may complain of a weak grip when using, for example, a screwdriver or a hammer. Severe contractures cause metacarpophalangeal (MCP) joint flexion and interphalangeal (IP) joint extension, resulting in an intrinsic-plus deformity. The patient experiences difficulty in grasping, pinching, and abducting the fingers. In combination with sensory loss, the hand is severely disabled. Individual involvement of intrinsic muscles results in characteristic deformities. Lumbrical contracture causes finger extension while the patient is trying to flex the finger. The origin of the lumbrical is pulled proximally with extrinsic flexion, and the IP joints are extended. Contraction of the abductor digiti minimi presents as small-finger abduction and causes MCP joint flexion and IP joint extension. Thenar intrinsic muscle contracture can cause thumb adduction, MCP joint flexion, and IP joint hyperextension. The patient loses effective pinch, large-volume grip, and hand dexterity. Intrinsic and extrinsic tightness may coexist in the same patient. Intrinsic contracture may not be clinically apparent until associated extrinsic changes are corrected. In cases of extrinsic tightness, proximal IP (PIP) joint flexion increases when the MCP joint is extended and decreases when the MCP joint is flexed. It should be kept in mind that the ability to flex PIP joints does not exclude intrinsic contracture. PIP flexion should be evaluated while the MCP joint is extended. The APB abducts the thumb away from the palm. The FPB flexes the thumb MCP joint. The opponens pollicis abducts, flexes, and pronates the first metacarpal. With these muscles, the thumb is brought from lateral to medial position across the palm in opposition to the four ulnar digits. The adductor pollicis adducts the thumb toward the palm. The ADM abducts the little finger away from the fourth finger. The FDMB flexes the little finger at the MCP joint. The ODM abducts, flexes, and supinates the fifth metacarpal. With these muscles, the little finger is brought into opposition to the thumb. Most anatomists describe three palmar interosseous muscles and four dorsal interosseous muscles. The dorsal interossei flex the MCP joints and extend the IP joints. The dorsal interossei also abduct the four ulnar digits from one another; the palmar interossei adduct the four ulnar digits together toward the third finger. The four lumbrical muscles function as a connection between the flexor digitorum profundus (FDP) and the extensor mechanism. Their main function is to facilitate extension of the IP joints. The lumbricals can extend the IP joints in any position of the MCP joints. Median nerve injuries are commonly referred to as high (ie, at or above the elbow) or low (ie, distal forearm to midforearm). Whereas a high injury affects both intrinsic and intrinsic motor function, a low injury affects only intrinsic motor function. The IP joints of the thumb and the index and middle fingers cannot flex as a result of paralysis of the FDP and FDS motor units. If the ulnar nerve supplies the FDP to the ring finger, the ring finger IP joints can then flex. The ulnar nerve supplies the FDP motor units to the ring and little fingers, so that the fourth and fifth fingers can flex. The APB and the opponens pollicis are paralyzed. The thumb rests in the plane of the palm and cannot be positioned for a pulp-to-pulp pinch between the thumb and fingers. The thumb IP joint is extended because of paralysis of the FPL. Median nerve injury at the wrist preserves extrinsic muscle function. The pronator teres, FDS, FDP, and FPL motor units are intact. The first two lumbricals, the APB, and the opponens pollicis are paralyzed. When the patient slowly makes a fist, the index and middle fingers clearly lag behind the fourth and fifth fingers because of a lack of initiation of flexion at the MCP joints by the lumbricals. The thumb rests in the plane of the palm and cannot oppose the fingers (see the image below). The patient can flex the thumb terminal phalanx because the FPL is not paralyzed. Intrinsic muscles innervated by median nerve (abductor pollicis brevis and opponens pollicis) are checked by resisting palmar abduction of thumb. High ulnar nerve injury results in paralysis of the flexor carpi ulnaris (FCU) and the ulnar half of the flexor FDPs, generally FDPs III-V. The distal phalanges of the fourth and fifth fingers cannot flex. Because the FDP motor units have a common origin, some weak flexion of the fourth and fifth fingers may be possible even if the ulnar half is supplied by the ulnar nerve. An attempt to flex the wrist results in radial deviation due to paralysis of the FCU. All seven interossei, the third and fourth lumbrical muscles, the adductor pollicis, generally one head of the FPB, and all three hypothenar muscles (FDMB, ADM, and ODM) are paralyzed. The patient cannot adduct or abduct the fingers. If the examiner places a piece of paper between the patient's fingers, he or she cannot hold it when the paper is pulled away. The MCP joints are hyperextended, and the IP joints are flexed. These changes are more obvious at the ring and little fingers, because the first and second lumbrical muscles are not paralyzed. This condition is called a claw-hand deformity . The thumb can weakly adduct through the extensor pollicis longus (EPL). 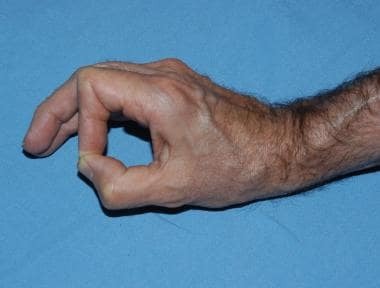 The patient can pinch and hold a paper between the thumb and index finger by strongly flexing the IP joint with the FPL. The combination of strong IP and weak MCP flexion is called the Froment sign. Ulnar nerve injury at the wrist spares the FCU and the medial half of the FDPs. The patient can flex the wrist and all the distal IP (DIP) joints. However, all intrinsic muscles innervated by the ulnar nerve are paralyzed, and both the clawhand deformity and the Froment sign (see the image below) are prominent. Image from patient with ulnar neuropathy demonstrates Froment sign during pinching. Loss of ulnar-innervated adductor pollicis results in reliance on flexor pollicis longus and exaggerated interphalangeal (IP) joint flexion. Loss of metacarpophalangeal (MCP) joint flexor leads to MCP hyperextension over time. Open or closed trauma is the most frequent cause of intrinsic hand deformities. [9, 10] Intrinsic muscle contracture can also be caused by inflammation, tumor, central nervous system disease, joint destruction, leprosy (Hansen disease), compartment syndrome, or rheumatoid disease. Prolonged immobilization in a tight cast or splint can cause intrinsic muscle tightness. Although sensory loss contributes to the overall impairment, it does not contribute to the deformity. Ulnar nerve compression can occur at the elbow (the cubital tunnel) or at the wrist (in the Guyon canal). Median nerve compression associated with intrinsic loss can occur with pronator syndrome or carpal tunnel syndrome. Anterior interosseous nerve compression does not result in intrinsic loss, because this nerve innervates only the extrinsic motor units. The most common cause of intrinsic hand deformities is trauma. Peripheral nerve palsy, most commonly afflicting the ulnar nerve at the elbow, occurs in 20-25% of patients with leprosy. Claw hand due to ulnar nerve paresis is therefore the most common presentation in this group of patients. Tubbs RS, Rogers JM, Loukas M, Cömert A, Shoja MM, Cohen-Gadol AA. Anatomy of the palmar branch of the ulnar nerve: application to ulnar and median nerve decompressive surgery. J Neurosurg. 2011 Jan. 114 (1):263-7. [Medline]. Loukas M, Louis RG Jr, Wartmann CT, Tubbs RS, Turan-Ozdemir S, Kramer J. The clinical anatomy of the communications between the radial and ulnar nerves on the dorsal surface of the hand. Surg Radiol Anat. 2008 Mar. 30 (2):85-90. [Medline]. Tubiana R, Malek R. Paralysis of the intrinsic muscles of the fingers. Surg Clin North Am. 1968 Oct. 48 (5):1139-48. [Medline]. Schreuders TA, Roebroeck ME, Jaquet JB, Hovius SE, Stam HJ. Long-term outcome of muscle strength in ulnar and median nerve injury: comparing manual muscle strength testing, grip and pinch strength dynamometers and a new intrinsic muscle strength dynamometer. J Rehabil Med. 2004 Nov. 36 (6):273-8. [Medline]. Pillai AK, Bashir M, Ferral H, Paruchuri S, Domkan A. Median nerve injury as a result of medial brachial fascial compartment syndrome. J Vasc Interv Radiol. 2007 Nov. 18 (11):1434-5. [Medline]. Ellison MR, Flatt AE, Kelly KJ. Ulnar drift of the fingers in rheumatoid disease. Treatment by crossed intrinsic tendon transfer. J Bone Joint Surg Am. 1971 Sep. 53 (6):1061-82. [Medline]. Cempla J, Pieniazek M, Pelczar-Pieniazek M. Regimen and results of physiotherapy in patients following surgical treatment of ulnar nerve injury. Ortop Traumatol Rehabil. 2007 Sep-Oct. 9 (5):499-510. [Medline]. Jamali AR, Bhatti A, Mehboob G. Transfer of extensor carpi radialis brevis as an extensor to extensor motor transfer (EEMT) in ulnar nerve palsy. J Pak Med Assoc. 2006 Jul. 56 (7):309-13. [Medline]. Noaman HH. Management and functional outcomes of combined injuries of flexor tendons, nerves, and vessels at the wrist. Microsurgery. 2007. 27 (6):536-43. [Medline]. McKeon KE, Lee DH. Posttraumatic Boutonnière and Swan Neck Deformities. J Am Acad Orthop Surg. 2015 Oct. 23 (10):623-32. [Medline]. Toyama S, Tokunaga D, Fujiwara H, Oda R, Kobashi H, Okumura H, et al. Rheumatoid arthritis of the hand: a five-year longitudinal analysis of clinical and radiographic findings. Mod Rheumatol. 2014 Jan. 24 (1):69-77. [Medline]. Neumeister MW. Examination of the hand. Russell RC, ed. Plastic Surgery Indications, Operations, and Outcomes: Volume Four, Hand Surgery. St Louis: Mosby-Year Book; 2000. 1667-93. Towfigh H, Gruber P. Surgical treatment of the boutonnière deformity. Oper Orthop Traumatol. 2005 Feb. 17 (1):66-78. [Medline]. Silva PG, Lombardi I Jr, Breitschwerdt C, Poli Araújo PM, Natour J. Functional thumb orthosis for type I and II boutonniere deformity on the dominant hand in patients with rheumatoid arthritis: a randomized controlled study. Clin Rehabil. 2008 Aug. 22 (8):684-9. [Medline]. Lee FS, Gellman H. Reconstruction of intrinsic hand deformities. Hand Clin. 1998 Aug. 14 (3):499-506, xi. [Medline]. Matsuo T, Matsuo A, Hajime T, Fukumoto S, Chen W, Iwamoto Y. Release of flexors and intrinsic muscles for finger spasticity in cerebral palsy. Clin Orthop Relat Res. 2001 Mar. 162-8. [Medline]. Sundararaj GD, Mani K. Surgical reconstruction of the hand with triple nerve palsy. J Bone Joint Surg Br. 1984 Mar. 66 (2):260-4. [Medline]. BUNNELL S. Ischaemic contracture, local, in the hand. J Bone Joint Surg Am. 1953 Jan. 35-A (1):88-101. [Medline]. Smith RJ. Non-ischemic contractures of the intrinsic muscles of the hand. J Bone Joint Surg Am. 1971 Oct. 53 (7):1313-31. [Medline]. Hotchkiss RN. Treatment of the stiff finger and hand. Wolfe SW, Hotchkiss RN, Pederson WC, Kozin SH, Cohen MS, eds. Green's Operative Hand Surgery. 7th ed. Philadelphia: Elsevier; 2017. Vol 1: 338-44. Rath S. Immediate postoperative active mobilization versus immobilization following tendon transfer for claw deformity correction in the hand. J Hand Surg Am. 2008 Feb. 33 (2):232-40. [Medline]. Merritt WH. Relative motion splint: active motion after extensor tendon injury and repair. J Hand Surg Am. 2014 Jun. 39 (6):1187-94. [Medline]. Gaul JS Jr. Intrinsic motor recovery--a long-term study of ulnar nerve repair. J Hand Surg Am. 1982 Sep. 7 (5):502-8. [Medline]. Schwarz RJ, Macdonald M. Assessment of results of opponensplasty. J Hand Surg Br. 2003 Dec. 28 (6):593-6. [Medline]. Chung MS, Baek GH, Oh JH, Lee YH, Cho HE, Gong HS. Extensor indicis proprius transfer for the abducted small finger. J Hand Surg Am. 2008 Mar. 33 (3):392-7. [Medline]. de Roode CP, James MA, McCarroll HR Jr. Abductor digit minimi opponensplasty: technique, modifications, and measurement of opposition. Tech Hand Up Extrem Surg. 2010 Mar. 14 (1):51-3. [Medline]. Al-Qattan MM. Technique of Split Flexor Carpi Ulnaris Opponensplasty. J Hand Surg Am. 2017 Sep. 42 (9):757.e1-757.e3. [Medline]. Rymer B, Thomas PB. The Camitz transfer and its modifications: a review. J Hand Surg Eur Vol. 2016 Jul. 41 (6):632-7. [Medline]. Lin CH, Wei FC. Immediate Camitz opponensplasty in acute thenar muscle injury. Ann Plast Surg. 2000 Mar. 44 (3):270-6. [Medline]. Pillukat T, Ritter S, Fuhrmann RA, Windolf J, van Schoonhoven J. [Operative treatment of claw deformity by lassoplasty]. Oper Orthop Traumatol. 2013 Aug. 25 (4):331-9. [Medline]. Valero-Cuevas FJ, Hentz VR. Releasing the A3 pulley and leaving flexor superficialis intact increases pinch force following the Zancolli lasso procedures to prevent claw deformity in the intrinsic palsied finger. J Orthop Res. 2002 Sep. 20 (5):902-9. [Medline]. Ulnar-innervated intrinsic muscles can be checked by resisting abduction of index (first dorsal interosseous muscle) and small fingers (abductor digiti minimi). Gloved examiner checks for intrinsic tightness. With metacarpophalangeal (MCP) joint hyperextended, proximal interphalangeal (PIP) joint is passively flexed. Intrinsic muscles are volar to axis of rotation of MCP joint and dorsal to axis of PIP joint. MCP joint hyperextension tightens intrinsics. Results of this test are compared with those in contralatera, normal hand. Note intrinsic atrophy in first dorsal web space. Image from patient with partial ulnar nerve paralysis who is asked to extend digits. Hyperextension of metacarpophalangeal (MCP) joints of ring and small fingers occurs with loss of intrinsic ulnar-innervated MCP flexors. Index and middle fingers have median-innervated intrinsics (lumbricals) that allow extrinsics to extend interphalangeal (IP) joints. When examiner prevents metacarpophalangeal (MCP) hyperextension of ring and fifth fingers, patient can completely extend interphalangeal (IP) joints with extrinsic tendons.